They were smaller then I thought they would be. The ribbons started shredding as soon as we got them out. Other than the ribbons they are excellent knives. I gave them to my friend for his birthday and he wears them everywhere. He really loves them and can get them to stick easy. These knives are alot smaller than i expected... they are pretty hard to get stuck in the target and the ribbon gets shredded up if it hits the ground. Over all good knives worth the money. Along with a few other things I got from the website, they came to my door within three days using the 1 cent shipping deal. BUDK is always fast with their shipping. They have sharp points but dull blades; although I've been able to stick the knives either handle or blade side in my foam block target. The ribbons were frayed when I got them, and became worse with usage. I plan to replace them though. Overall a good deal for some nice throwing knives. 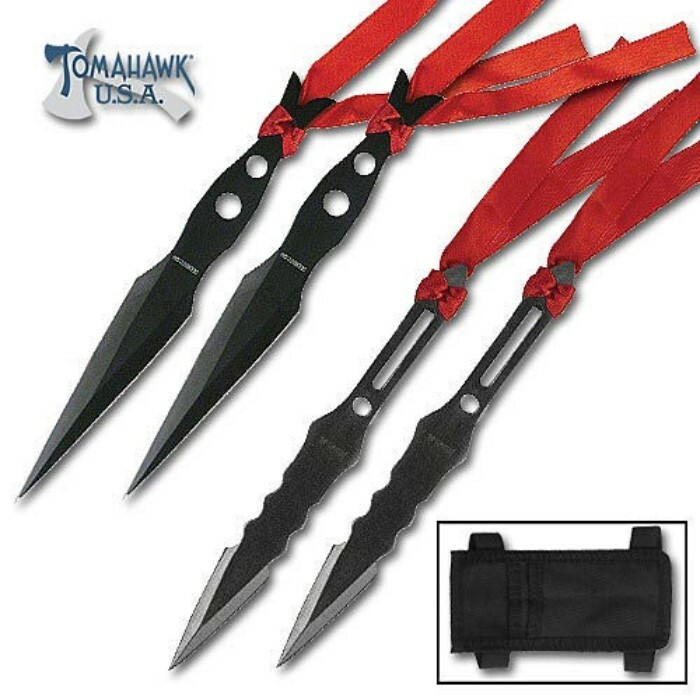 The ribbons are cheap and come off fast but the knifes are awesome and do take little effort to stick. great price, Get them. You can trust me when I say these are amazing because I'm in ninjutsu. These are one of the most durable and quick knifes you will find on this site. No doubt you'll bada** with them to, I rarely miss my taget. Their not crazy good but a thumbs up.